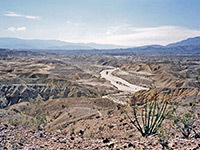 The seasonal Fish Creek Wash flows north from the colorful but desolate Carrizo Badlands through the edge of the Fish Creek Mountains via a deep, quite narrow canyon then disperses into the flat sandy plains west of the Salton Sea. The canyon is usually dry, dusty and very hot, and the climatic extremes together with occasional flash floods have weathered the rock layers - already twisted and partly mineralized by metamorphic activity - into a medley of colors and forms. A walk through here is the main attraction of the 2 mile Split Mountain Trail, which continues to the edge of the badlands to an area of eroded sandstone cavities known as the Wind Caves. Map of Anza-Borrego Desert State Park; topographic map of the Split Mountain Trail. The trail is a popular hiking route in the cooler seasons but not in summer as the heat is too severe. Most is also accessible by 4WD vehicles, which can be driven further into the badlands, where the streamway divides into many winding tributaries that can be followed for long distances southwards; some link with other tracks that start from road S2, the main southern approach to the state park. 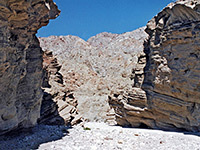 The paved Split Mountain Road provides access to the east central area of Anza Borrego; from the small village of Ocotillo Wells it crosses flat, partially irrigated desert and ends at a gypsum mine, passing the Elephant Tree trailhead en route - from here starts a 1.5 mile self-guiding nature trail around the end of a wide, boulder-strewn wash, encountering many desert plants but just a single surviving species of the tree, a rather anonymous species with outsize branches. Fish Creek Wash crosses the road just before the mine about 2 miles from the end of the narrows. In dry weather, most regular cars can be driven along the streambed to the point where the 600 foot high cliffs close in, thus avoiding a long hike across uninteresting terrain. The nearby Fish Creek Primitive Campground offers limited facilities but nice views. 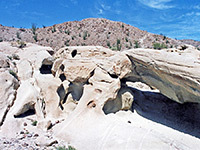 Once in the canyon, the heat increases and the surrounding rocks rise up for a distance of about one mile, where the wash has several long straightish sections and a few narrow bends. Shortly after it widens, the trail turns east, climbs up a stony hillside then follows a ridge, ending at a high observation point with views over the northern part of the vast, undulating Carrizo Badlands, and close to the Wind Caves. These are rather underwhelming, a small collection of wind-eroded hollows and small arches in a sandstone outcrop which do at least provide a cool respite from the sun. Another prominent feature is Elephant Knees, a stratified escarpment with fluted ridges, rising several hundred feet above the muddy hills in the foreground.